Are you on your trip to Sri Lanka already gone through beautiful places, met millennial cultures and now stopped in Negombo, Sri Lanka without knowing what to do? Continue reading and find out. Let’s go ahead, Negombo is a city worth visiting on the beach (do not go too thirsty to the pot), some places to visit and be the entrance or exit. Or, if you’re in Colombo, why not stop at Negombo, is it a leap from the airport? 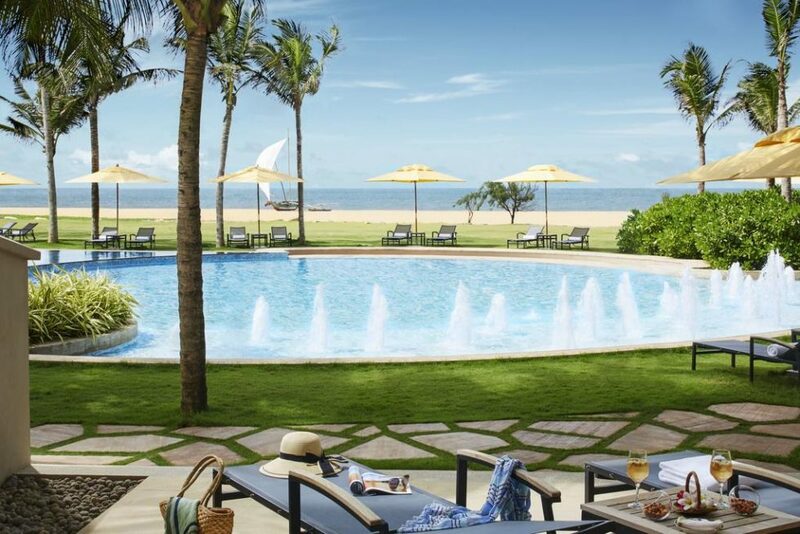 First, we’ll first explain why it’s worth booking a few days in Negombo, Sri Lanka. Maybe you’ve heard some truths out there about the beach or things like that. Things like being a bit polluted or even uncharacterized by tourism. This really happens, we will not fool you. But think on the bright side, since it is near the airport, it is the best place to be on the first or last hours in Sei Lanka. Let’s see what’s best in it! So if you have come here we will unlock the best suggestions to know and some ideas on how to do this and by what means. Does it pay to take a tuk-tuk or give to do the bike route? Why stay in Negombo and not in Colombo? What is the difference between the two cities? How to visit the two towns and live new experiences? Calm down, it is normal to have these doubts continue reading you will get all these answers. Come with us! What to see in Negombo, Sri Lanka? Why visit Negombo instead of Colombo? How to move around in Negombo? How to get from the airport to Negombo or vice versa? How to get from Negombo to Colombo? What are the best restaurants in Negombo? 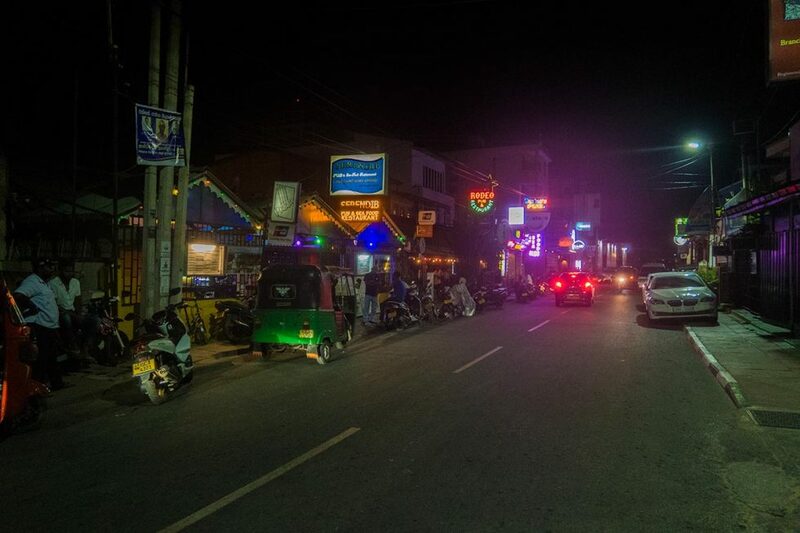 The nightlife in Negombo like? Where to stay in Negombo Sri Lanka? How many days to stay in Negombo? Negombo beach is close to some resorts, hotels (soon to suggest the best), restaurants and the Dutch Clock Tower. It is worth to savor a meal or relax. 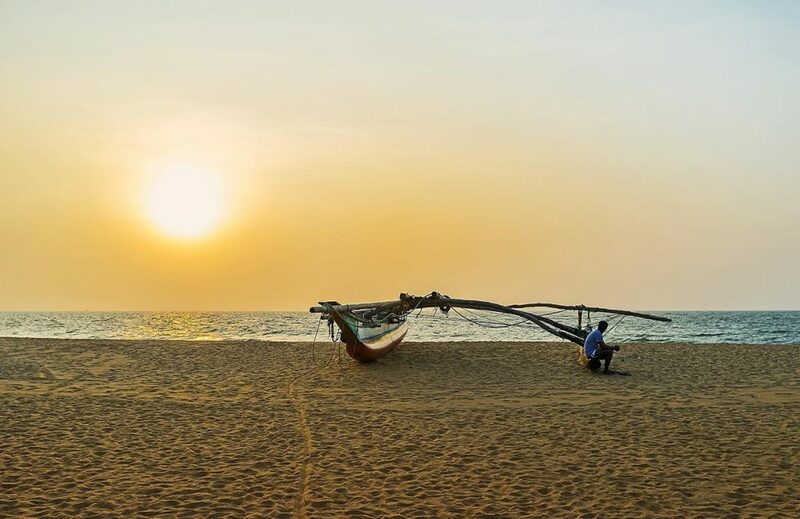 It is not the cleanest, there are indeed better beaches in Sri Lanka, but Negombo beach is ideal for walking along the waterfront or spending a few hours watching the fishermen launch their nets. As it is close to the Airport, it is an excellent place to wait for the flight or to rest after landing the plane. Visit the Fish Market not only to buy fish but especially to visit the environment and see the process of drying, selling or transporting the fish to other markets. 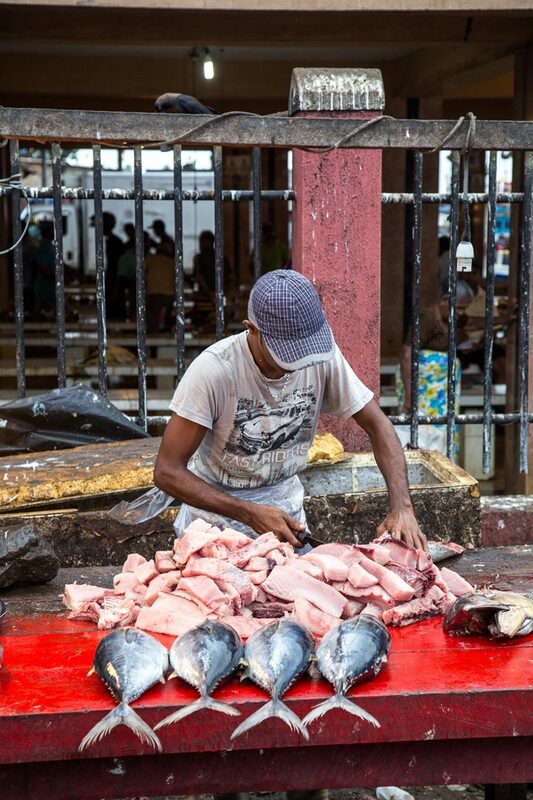 This method involves picking up the fresh fish and putting it in the sun until it is dry. It emerged to prevent fish from deteriorating in the post-harvest period. Thus the Fish Market offers a quality fish, tasty at a low cost. In some cases, even with this technique they lose fish because of poor soil condition, the winds or are contaminated by insects. You need to see the myriad species of fish, some you do not even know about: sharks, barracudas and other exotic fish. It is worthwhile to go and check carefully the day to day of these warriors who struggle to keep their families. Always have some guide to explain about the fish and the drying processes, they do not charge, but it is worth giving a tip for the presentation. The Dutch Fort of Negombo is the old Dutch fort equal to what it has in Colombo. It refers to those historical monuments that serve as a compass for the commercial navigations that existed between Sri Lanka and other countries. It used to protect the cities from attacks of the enemies during the Portuguese colonization and later the Dutch. It is close to the seafront and still has that colonial gate of the seventeenth century. Today, the attraction of the fort are the games and cricket and the grounds of the site is protected by the prison of the city. It is worth going to know history and take some photos. The lagoon of Colombo is a beautiful place and even better than the beach of Negombo. Apart from the social situations of the inhabitants of the region, it is legal to stop to get to know the place. 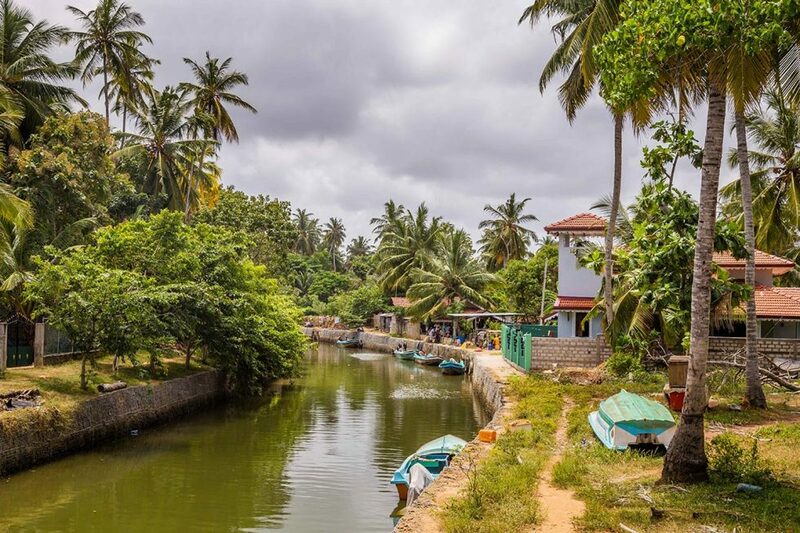 It is close to the coastal area of Negombo and is an excellent lagoon for boating, fishing for some fish, enjoying nature and getting away from the hectic city routine. You will be able to know very different fishing of the inhabitants of the region. They follow the fish by the seasons. They often use canoes carved from tree trunks and fish with nylon nets only from September to April, sad right? Yes, if it is a clear day when standing in the middle of the lagoon (it is shallow), you will see the island of Jesus, and you will see that it has a long coconut tree where you can see the fish ports and the mangroves. The history of the Angurukaramulla Temple attracts the statue of Buddha, the dragon inside the temple and the walls thousands of years ago. You will find the ruins of a library. To enter the temple, you must walk through the mouth of the dragon (they believe to ward off evil spirits) and the statue is about six feet tall a real structure. And there is more inside you will find lots of green area, trees and in the middle a pond with many turtles, they give good photos. There are other sculptures, paintings and the Buddha story inside the temple. Next to time is the stupa with several lions guarding the temple. This place has other sculptures and paintings and the lack of lighting, the ideal is to go in the afternoon to see, including the mini stupa inside the stupa and artistic works. The library inside is impressive because of the staircases and the structure we have the impression that some 300 years ago, the place was majestic. The Church of St. Mary is a symbol of the country’s Catholicism and the artistic and religious reference in Negombo, Sri Lanka. It is located in the Gampaha neighborhood and near the Katunayake airport from Colombo. It is a place that expresses the life of Christ. The sculptures and paintings still remain vivid. The highlight of the site is the altar imported by Europe. In this environment, you can see the junction of European culture with the Sinhalese: the colors, the exuberance, the details and the ancient architecture of a sacred and charming place. The Dutch Channel is a water reserve that cuts through the city and flows into the Negombo Lagoon. It passes through several houses, plantations and has stunning views. It is located near the Fish Market and about 1km from the Church of Santa Maria. Be aware that the place is somewhat polluted with plastics, but worth it for the experience of feeding the monkeys and birds during the ride. Duwa is an island of fishermen, and hundreds of years ago it was famous for preserving the dramatic representation of the passion of Jesus Christ. The Duwa Passion Play – is the most celebrated staging of the Passion of Christ in the country. It takes place in Holy Week at the time of Easter. 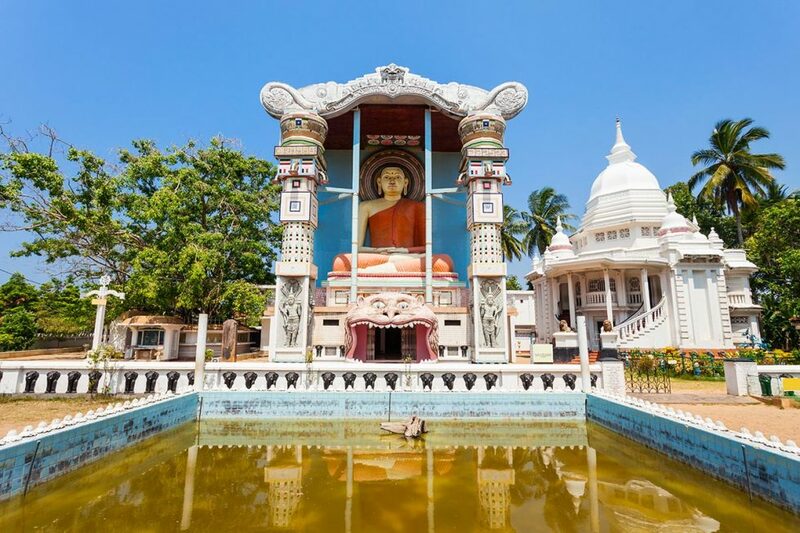 Because the city of Negombo is very Catholic, several villages preserve the traditions of Christianity and perform well-crafted presentations, including professional actors. Negombo is a small town and attractions are nearby. Colombo is a bigger city, with all the main attractions scattered throughout the city, where you will need some transportation. 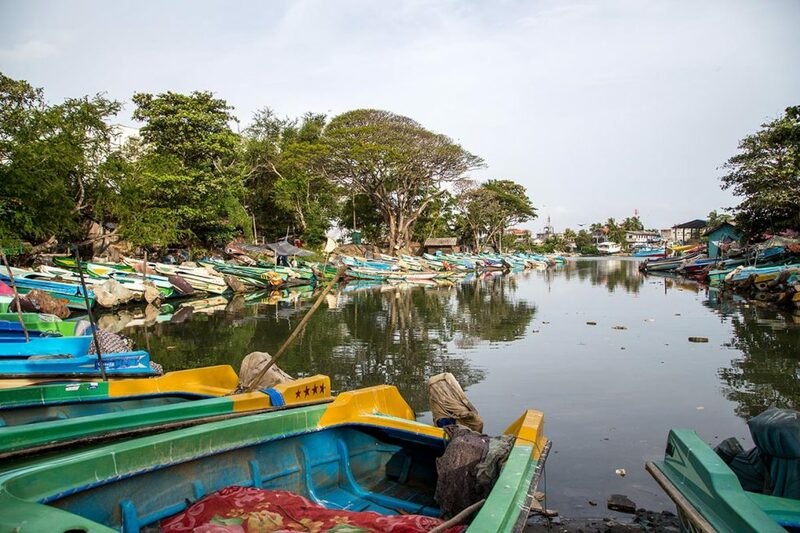 Although Negombo in Sri Lanka is a stopover, there are plenty of options for you to get acquainted with the day to day life of the Sinhalese: visit the Fish Market or even stroll through the lagoon in the heart of the city. Colombo is a city very rich in attractions. However, it is very noisy, and it will be almost impossible for you to relax somewhere away from all the frenzy from the capital. Want to know more about Colombo? Read and discover what to do in the capital of Sri Lanka. In any case, it is worth knowing the two cities. Each one reveals its own identity and has different and equally exciting attractions. Get the tip for your tour through Negombo, Sri Lanka. 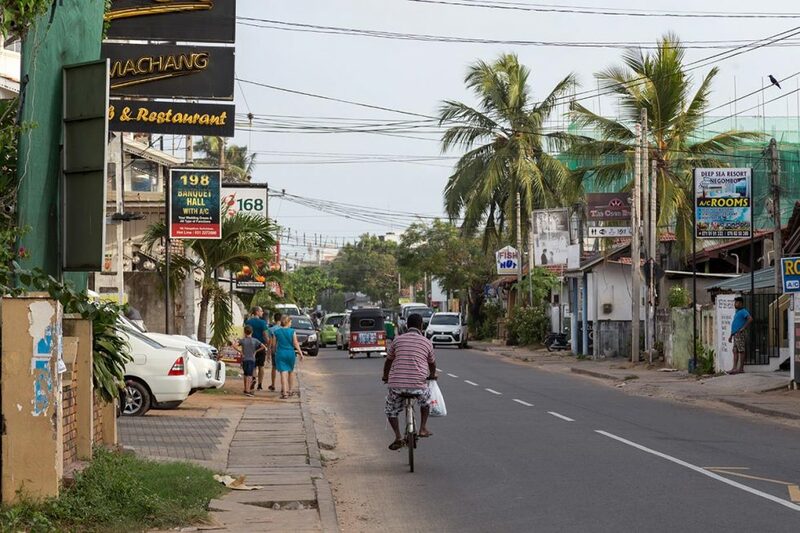 As previously stated, Negombo is a small and quiet town, walking is the best solution. It does not pay to take tuk-tuk with their abusive drivers, because the main attractions are close together. When you get off the Colombo airport, you will undoubtedly want to hurry up and get into the first mode of transportation that appears in front of you. Careful, danger in sight! Calm down, the danger is with your pocket, for now, traveling this region is quiet for both sexes, including for you who prefer to go alone. You should be concerned with charlatans who come out of good friends but are nothing more than explorers. Ignore the rickshaws that already lurk at Columbus Airport waiting to take you to your destination. Across the street, there is a bus station that can take you to Negombo without any problem, despite being a bit time consuming, of course! Another tip is you download Uber and call the driver through the application. The advantage is that they are faster, you only pay one way, but stay smart with some who cheat. Do you know what they do? They say you did not pay for the race (paid for with the card) and ask for money. To avoid these conflicts, at the end of the payment, ask the driver to show you the confirmation that the transaction was successful. Relax we have more information and tips on Sri Lanka transport for you to be well informed and armored against these misleading attacks. If you are in Negombo and want to go to Colombo, maybe Uber is the best solution to transport you from one city to another. The bus is still another solution, cheaper, but it is a bit more time-consuming. If you’re not in a hurry, it’s also a good solution. Avoid picking up the rickshaws that are gross and charge above average prices. Negombo, Sri Lanka has restaurants to suit all tastes: Oriental, Asian and even those pizzas we ordered on most rainy days. Check out our suggestions! Mr. Burger has nothing to do with snacks. They serve typical Sinhalese foods: rice and curry, paratha, dhal, kuthi. It is close to Negombo beach which is a beautiful place. The owner of the restaurant is attentive and helpful. Do not go by the look of the place that is not very attractive, but the dining experience and for your pocket are really advantageous. Tusker restaurant is a cozy place serving from Sinhalese foods to diet foods or vegans. It is close to Main Street, hotels, Negombo beach. The price is value for money, not too expensive. Enjoy trying prawns, banana cookies, clams, fried rice, chicken with pepper and more. Sea View is a restaurant with outdoor seating serving Asian and Western foods. It is considered a restaurant that has more differentiated prices and services. It is close to several hotels and near the public cemetery in Negombo Sri Lanka. Try the grilled shrimp and have a beer at lunchtime. It’s delicious. The Port Beach Restaurant & Pub is a beachfront restaurant. The menu they serve is more Sri Lankan food with a hint of European. It is located on the seafront near Negombo beach. Savor the local food to the sound of live music and the noise of the waters of the sea. Dolce Vita is an Italian-themed café and restaurant that sits on the seafront of Negombo Beach. It serves Western dishes including the typical western breakfast like the pizzas. Imagine you staying under the shade eating that pizza by drinking an orange juice with coconut! The Simply Strawberry is an American candy that serves ice creams, pastries, cakes, and stuffed pies. It is located near the beach area in Negombo. It pays to give you that laid back and eat western treats. 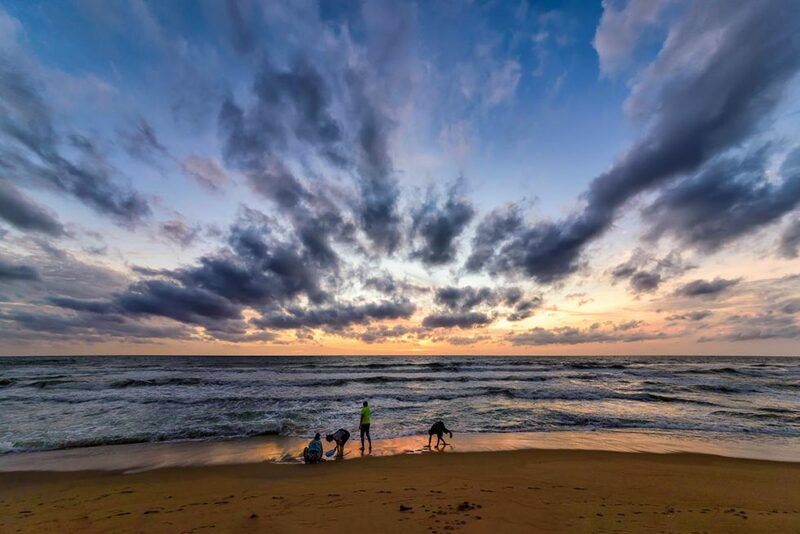 When the sun sets, Negombo Sri Lanka gains life and energy by the beach. If you enjoy the nightlife, be sure to visit this city and especially the bars and restaurants. Rodeo Pub: live music and exotic cocktails and aphrodisiacs. The parties in Negombo Sri Lanka are not like the hype that we used to see in Cancun. In Negombo, everything should be moderate and always respect the locals. Do not forget to drink in moderation since the police control this and if you go beyond the limits, you will be fined. So, control yourself! Check out our suggestions for hostels or resorts that we prepare for you to stay safe and comfortable on your way through Negombo. Heritance is a modern and pleasant resort. It has a great location about 10 minutes from the international airport, the beaches and other places of leisure. 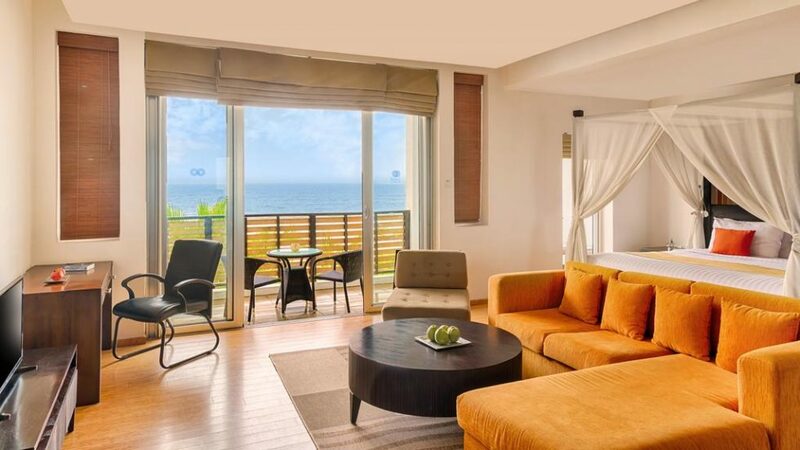 It offers extra convenience for travelers who value comfort or who wish to spend more days in the Negombo region of Sri Lanka. This resort consists of double or single beds, room services with extras such as suites, spas, and restaurants. Enjoy the resort pool, get a massage or have a relaxing bath at the spa. The Jetwing Sea is a classic resort and offers facilities for a good day of rest. It is close to the Dutch Clock Tower and about 6 minutes from Bandaranayake International Airport. Well worth it because it is a place with excellent service, rooms with nice ambiance, clean and space to enjoy the view of the beach. The Tour Inn Hostel is one of the best hostels in Negombo, Sri Lanka. It pays off for a quick and comfortable journey, as it provides a living room and kitchen for guests. The Bluray is a simple hostel, but also practical since it offers travelers the conditions to prepare those fast meals. It is close to the beach, so it is well worth the money to pay per night and the convenience of commuting. When it comes to differentials, it may be that depending on your room you will be fully equipped with refrigerators and dishwashers. The climate in Negombo is tropical hot in the summer, with long winter with a stormy and closed sky. Temperatures range from 23 ° C to 32 ° C and never exceed 34 ° C.
Although the temperatures are mild, the air humidity is moderate and undergoes slight seasonal variations. The best time to visit Negombo is the middle of December until the middle of March. This is because in other times there are monsoons that occur in the city and bring winds and sometimes floods. We have an article with more accurate information about the climate in Sri Lanka. Enjoy and check out the other tips for you to create your best travel itinerary in Sri Lanka. As we have said, Negombo is the city of entry or departure for Sri Lanka. We recommend that you stay for a maximum of 2 days and take a trip to Colombo as the cities are nearby. Make a detour to get to know the two cities (Colombo and Negombo) and gain energy for the next adventures ahead! Negombo as you can see there are not many attractions to see. It is worth visiting the local festivals, customs and enjoys the adventures by the lagoon. Savor the food by the beach and why not relax in one of our hostel and resort suggestions? It’s our tip! And my friend, what did you think of our article on Negombo, Sri Lanka? Did you have any issues we did not mention? Share your concern with us who knows we can help you to plan your trip in Negombo, Sri Lanka? Você está em sua viagem ao Sri Lanka já passou por lugares maravilhosos, conheceu culturas milenares e agora parou em Negombo, Sri Lanka sem saber o que fazer? Vamos te adiantar, Negombo é uma cidade que vale a pena visitar pela praia (não vá com muita sede ao pote), alguns locais para visitar e ser a porta de entrada ou saída. Ou, se estiver em Colombo, por que não parar em Negombo, é um pulo do aeroporto? Bom vamos por parte, primeiro explicaremos o porquê vale a pena reservar alguns dias em Negombo, Sri Lanka. Talvez já tenhas escutado algumas verdades por aí sobre a praia ou coisas assim. Coisas como ser um pouco poluída ou até descaracterizada pelo turismo. Realmente isso acontece, não te vamos enganar. Mas pensa pelo lado bom, já que fica próximo do aeroporto, merece umaprecisas passar perto da cidade, vamos ver o que há de melhor nela! Por isso se você chegou até aqui vamos destrinchar as melhores sugestões para conhecer e algumas ideias de como fazer isso e por quais meios. Será que compensa pegar tuk tuk ou dar para fazer o percurso de bicicleta? Por que ficar em Negombo e não em Colombo? Qual a diferença das duas cidades? Como visitar as duas cidades e viver novas experiências? Calma, é normal existirem essas dúvidas continue a leitura que você vai ter todas essas respostas. Venha conosco! O que visitar em Negombo, Sri Lanka? Por que visitar Negombo em vez de Colombo? Como se deslocar em Negombo? Como ir do aeroporto para Negombo ou ao contrário? Como ir de Negombo para Colombo? Quais são os melhores restaurantes em Negombo? Como é a vida noturna em Negombo? Onde ficar em Negombo Sri lanka? Como é o clima e qual é a melhor época para visitar Negombo? Quantos dias ficar em Negombo? A praia de Negombo fica próximo a alguns resorts, hoteis (logo vamos sugerir os melhores), restaurantes e o Dutch Clock Tower. Vale a pena para saborear uma comida ou relaxar. 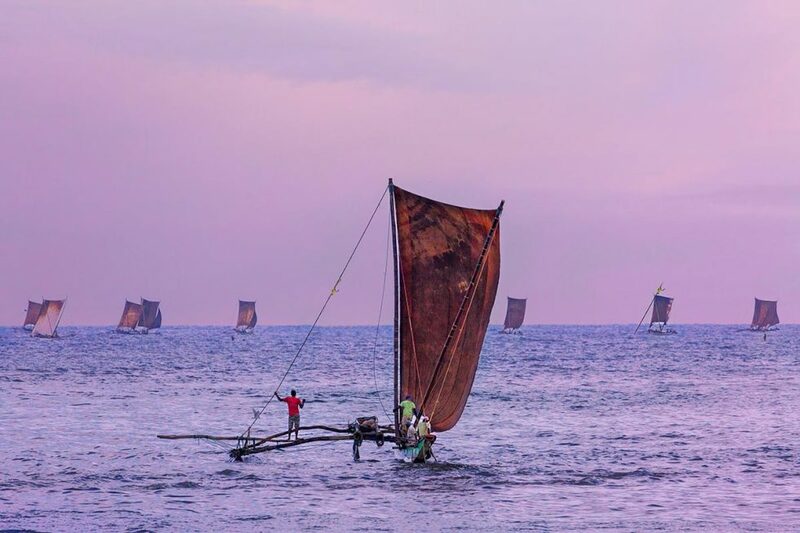 Ela não é das mais limpinhas, certamente existem praias melhores pelo Sri Lanka, mas a praia de Negombo é ideal para caminhar pela orla ou ficar algumas horas vendo os pescadores lançarem as redes. Como ela fica próxima do Aeroporto, é um bom local para esperar o voo, ou para descansar após o pouso do avião. Visite o Mercado de Peixe não só para comprar peixe, mas sobretudo para visitar o ambiente e ver o processo de secagem, venda ou transporte dos peixes a outros mercados. Esse método consiste em pegar o peixe fresco e o colocar no sol até que ele fique seco. Surgiu para evitar que os peixes sejam deteriorados no período pós-colheita. Assim o Mercado de Peixes oferece um peixe de qualidade, saboroso a um baixo custo. Em alguns casos, mesmo com essa técnica eles perdem peixes por causa da má condição do solo, os ventos ou são contaminados pelos insetos. Você precisa ver a infinidade de espécies de peixes, alguns, inclusive você nem conhece: tubarões, barracudas e outros peixes exóticos. Vale a pena ir e conferir de perto o dia a dia desses guerreiros que lutam para manterem as suas famílias. Sempre tem algum guia para te explicar sobre os peixes e os processos de secagem, eles não cobram, mas vale dar uma gorjeta pela apresentação. O Dutch Fort de Negombo é o antigo forte holandês igual o que tem em Colombo. Ele refere-se àqueles monumentos históricos que servem como bússola para as navegações comerciais que existiam entre o Sri Lanka e outros países. Além disso, ele protegia a cidades de ataques dos inimigos durante a colonização portuguesa e depois holandesa. Ele fica próximo à beira-mar e ainda tem aquele portão colonial do século XVII. Hoje, a atração do forte são os jogos e críquete e os terrenos do local é protegido pela prisão da cidade. Vale a pena passar para conhecer a história e tirar algumas fotos. A lagoa de Colombo é um lugar bacana e até melhor que a praia de Negombo. Tirando as situações sociais dos moradores da região, é legal parar para conhecer o lugar. Ele fica próximo à área costeira de Negombo e é uma lagoa excelente para passear de barco, pescar alguns peixes, apreciar a natureza e para fugir da rotina agitada da cidade. Além disso, você poderá conhecer uma pesca bem diferente dos moradores da região. Eles seguem os peixes pelas estações do ano. Costumam usar canoas esculpidas de troncos de árvores e pescam com as redes de nylon somente entre setembro a abril, triste né? Sim, se é um dia claro ao ficar em pé no meio da lagoa (é raso) você vai avistar a ilha de Jesus e verá que tem um longo pé de coco onde é possível ver os portos dos peixes e os manguezais. A história do Templo Angurukaramulla atrai pela estátua de Buda, o dragão que fica no interior do templo e os muros de milhares de anos atrás. Além disso você vai encontrar as ruínas de uma biblioteca. Para entrar no templo, você deve caminhar pela boca do dragão (eles acreditam afastar espíritos ruins) e a estátua tem cerca de seis metros de altura uma verdadeira estrutura. E tem mais no interior encontrará muita área verde, árvores e no meio uma lagoa com muitas tartarugas, rendem boas fotos. Além disso, existem outras esculturas, pinturas e a história de Buda no interior do templo. Ao lado do tempo tem a estupa com vários leões guardando o templo. Esse lugar possui outras esculturas e pinturas e pela falta de iluminação, o ideal é ir à tarde para conseguir ver, inclusive a mini estupa no interior da estupa e as obras artísticas. A biblioteca no interior é interessante por causa das escadarias e pela estrutura temos a impressão que há uns 300 anos atrás, o lugar foi majestoso. 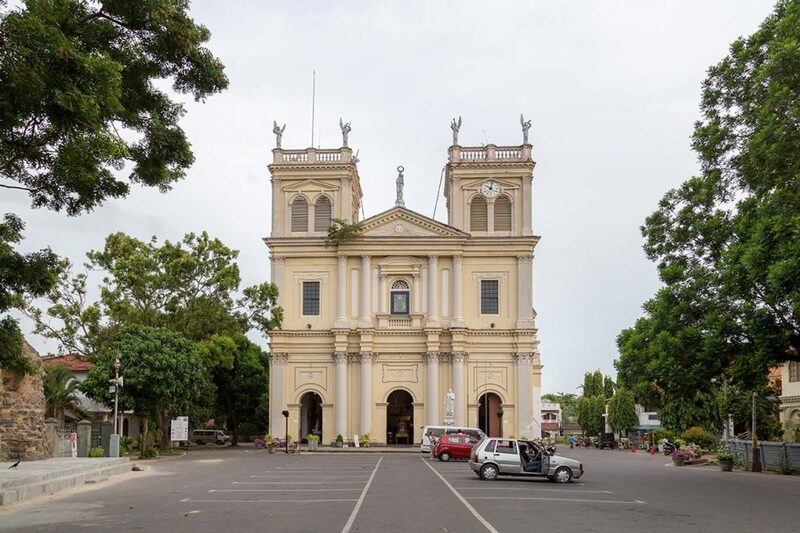 A Igreja de Santa Maria é um símbolo do catolicismo do país e a referência artística e religiosa em Negombo, Sri Lanka. Ela fica localizada no bairro Gampaha e próximo ao aeroporto Katunayake vindo de Colombo. É um lugar que expressa a vida de Cristo. As esculturas e pinturas ainda permanecem vívidas. O destaque do lugar é o altar importado pela Europa. Nesse ambiente você poderá ver a junção da cultura europeia com a cingalesa: as cores, a exuberância, os detalhes e a arquitetura milenar de um lugar sagrado e encantador. O Canal Holandês é uma reserva de água que corta a cidade e deságua na Lagoa de Negombo. Ele passa por diversas casas, plantações e tem vistas impressionantes. Ele fica localizado próximo ao Mercado de Peixes e cerca de 1km da Igreja de Santa Maria. Esteja ciente que o local é um pouco poluído com os plásticos, mas vale a pena pela experiência de alimentar os macacos e pássaros no decorrer do passeio. Duwa é uma ilha de pescadores e há centenas de anos ficou famosa por preservar a representação dramática da paixão de Jesus Cristo. A Duwa Passion Play ― é a maior encenação da Paixão de Cristo no país. Ela ocorre na Semana Santa na época da Páscoa. Devido a cidade de Negombo ser muito católica, várias aldeias preservam as tradições do cristianismo e realizam apresentações bem trabalhadas, inclusive com atores profissionais. Negombo é uma cidade pequena e as atrações são próximas. Enquanto que Colombo a cidade é maior e os destinos ficam dispersos pela cidade, onde você precisará de algum transporte. Embora Negombo no Sri Lanka seja parada, não faltam opções de você conhecer o dia a dia dos cingaleses: visitar o Mercado de Peixes ou até mesmo passear pela lagoa no coração da cidade. Já Colombo, é uma cidade muito rica em atrações, porém ela é muito barulhenta e será quase impossível você relaxar em algum lugar sem movimentações de pessoas. Quer saber mais sobre Colombo? Leia e descubra o que fazer na capital do Sri Lanka. De qualquer modo, vale a pena conhecer as duas cidades. Cada uma revela a sua identidade própria e possuem atrações diferentes e igualmente interessantes. Fica a dica para o seu passeio por Negombo, Sri Lanka. Como dito anteriormente, Negombo é uma cidade pequena e calma, andar a pé é a melhor solução. Não compensa pegar tuk tuk além deles serem exploradores, as atrações são próximas entre si. Ao descer do aeroporto de Colombo certamente você vai querer sair as pressas e entrar no primeiro meio de transporte que surgir na sua frente. Cuidado, perigo a vista! Calma, que o perigo é com o seu bolso, por enquanto, viajar por essa região é tranquilo para ambos sexos, inclusive para você que prefere viajar sozinho. Você deve se preocupar é com os charlatões que surgem se fazendo de bons amigos, mas não passam de exploradores. Ignore os rickshaws que já ficam à espreita no aeroporto de Colombo esperando para te levar ao seu destino. Do outro lado da rua tem uma estação de ônibus que podem te levar a Negombo sem nenhum problema, apesar de ser um pouco demorado, claro! Outra dica é você baixar o Uber e chamar o motorista pelo aplicativo. A vantagem é que eles são mais rápidos, você só paga a ida, mas fique esperto com alguns que trapaceiam. Sabe o que eles fazem? Dizem que você não pagou a corrida (sendo que pagou com o cartão) e pedem dinheiro. Para evitar esses conflitos, ao finalizar o pagamento, peça para o motorista te mostrar a confirmação que a transação foi efetuada com sucesso. Relaxe que temos mais informações e dicas sobre os transportes Sri Lanka para você ficar bem informado e blindado contra esses ataques de enganadores. Caso esteja em Negombo e queira ir para Colombo, talvez o Uber seja a melhor solução para te transportar de uma cidade para a outra. O ônibus é ainda outra solução, mais barata, mas é um pouco mais demorada. Se não estiver com pressa, é também uma boa solução. Evite pegar os rickshaws que são grosseiros e cobram preços acima do normal. Negombo, Sri Lanka tem restaurantes para todos os gostos: oriental, asiático e até aquelas pizzas que nós pedimos em dias de chuva principalmente. Confira as nossas sugestões! O Mr Burger não tem nada a ver com lanches. Eles servem comidas típicas cingalesas: arroz e curry, paratha, dhal, kuthi. 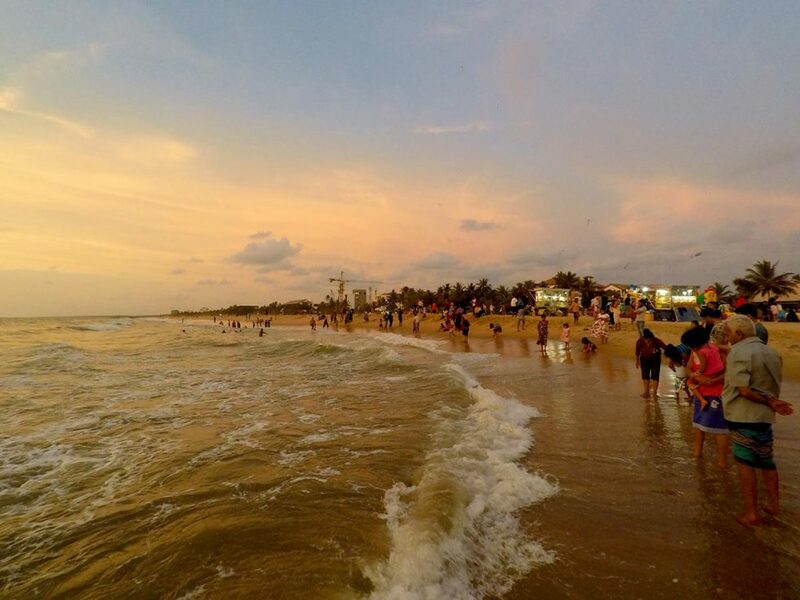 Ele fica próximo a praia de Negombo é um lugar agradável. O dono do restaurante é atencioso e prestativo. Não vá pela aparência do local que não é muito atrativa, mas a experiência gastronômica e para o seu bolso são realmente vantajosas. O restaurante Tusker é um lugar acolhedor servem desde comidas cingalesas a comidas diet ou veganas. Ele fica próximo a Main Street, hoteis, praia de Negombo. O preço vale pelo custo-benefício, não é muito caro. Aproveite para experimentar os camarões, os bolinhos de banana, os mariscos, o arroz frito, o frango com pimenta e muito mais. O Sea View é um restaurante com cadeiras ao ar livre que servem comidas asiáticas e ocidentais. Ele é considerado um restaurante que possui uns preços e serviços mais diferenciados. Ele fica próximo a vários hotéis e perto do cemitério público em Negombo Sri Lanka. Experimente o camarão grelhado e tomar uma cerveja na hora do almoço. Os serviços são muito limpos pode ficar tranquilo! O The Port Beach Restaurant & Pub é um restaurante à beira da praia. O cardápio que eles servem é mais comida cingalesa com uma pitada da europeia. Ele fica localizado em frente ao mar próximo da praia de Negombo. Saboreia a comida local ao som de música ao vivo e o barulho das águas do mar. O Dolce Vita é uma cafeteria e restaurante de origem italiana que fica instalado à beira-mar da praia de Negombo. Ele serve pratos ocidentais inclusive o típico café da manhã ocidental como as pizzas. Imagina você ficar debaixo da sombra comendo aquela pizza tomando um suco de laranja com coco! O Simplesmente morango é uma doceria americana que servem sorvetes, doces, bolos e tortas recheadas. Ele fica localizado próximo a zona de praia em Negombo. Vale a pena para você dar aquela relaxada e comer guloseimas ocidentais. 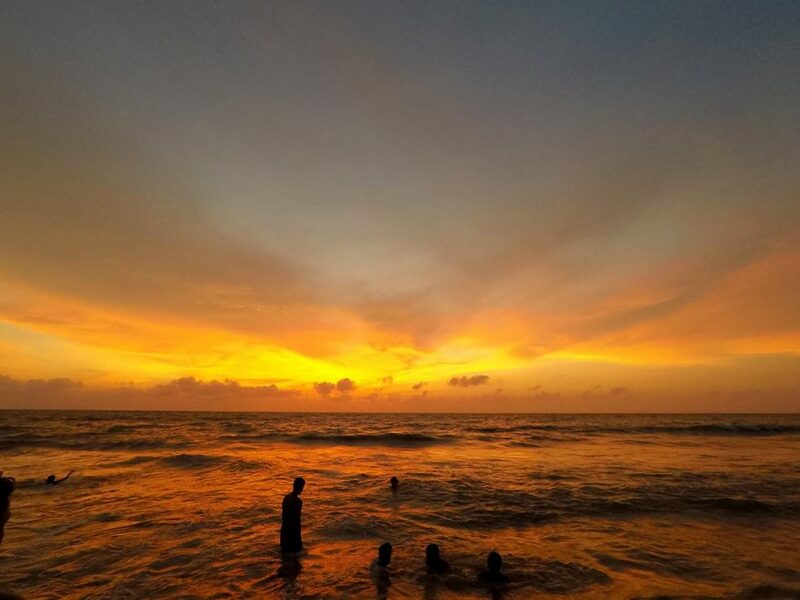 Quando o sol se põe, Negombo Sri Lanka ganha vida e energia à beira da praia. Se você aprecia a badalação a noite, não deixe de visitar essa cidade e principalmente os bares e restaurantes. Rodeo Pub: música ao vivo e coquetéis exóticos e afrodisíacos. As festas em Negombo Sri Lanka não são tipo as badalações que acostumamos ver em Cancún. Em Negombo tudo deve ser moderado e sempre respeite os habitantes locais. Não se esqueça de beber com moderação já que a polícia controla isso e se você ultrapassar dos limites, será multado. Então, controle-se! Confira as nossas sugestões de albergues (abrigos) ou resorts que preparamos para você ficar seguro e confortável em sua passagem por Negombo. O Heritance é um resort moderno e agradável. Possui uma excelente localização a cerca de 10 minutos do aeroporto internacional, as praias e outros lugares de lazer. Ele oferece uma comodidade extra para os viajantes que valorizam o conforto ou que pretendem passar mais dias na região de Negombo, Sri Lanka. Esse resort é composto por camas de casal ou solteiro, serviços de quarto com comodidades extras como suítes, spas e restaurantes. Aproveite para desfrutar da piscina do resort ou receber uma massagem, banhos relaxantes no spa. O Jetwing Sea é um resort clássico e que oferece comodidades para um bom dia de descanso. Ele fica próximo a Torre do relógio holandês e cerca de 6 minutos do aeroporto internacional de Bandaranayake. Vale a pena, porque é um lugar com um serviço excelente, quartos com ambiente agradável, limpo e espaço para apreciar a vista da praia. O Tour Inn Hostel é um dos melhores albergues em Negombo, Sri Lanka. Ele fica localizado próximo as áreas verdes a praia e mais uns 2km você tem acesso ao supermercado. Compensa para uma viagem rápida e confortável, já que ele disponibiliza uma sala de estar e cozinha para os hóspedes. Outra questão que você paga por noite então vale a pena pela praticidade. O Bluray é um albergue simples, mas também prático já que oferece condições dos viajantes preparar aquelas refeições rápidas. Ele fica próximo a praia então vale pela economia de pagar por noite e a praticidade de deslocamento. Ao se tratar de diferenciais pode ser que dependendo do seu quarto você estará totalmente equipado com geladeiras e lava-louças. O clima em Negombo é tropical quente no verão, com inverno longo com ventanias e céu fechado. As temperaturas variam de 23ºC a 32ºC e nunca ultrapassa a 34ºC. Apesar das temperaturas serem amenas, a umidade do ar é moderada sofrendo leves variações sazonais. A melhor época para visitar Negombo é da metade do mês de dezembro até meados do mês de março. Isso porque nas outras épocas existem monções que ocorrem na cidade e trazem ventanias e algumas vezes inundações. Temos um artigo com mais informações precisas sobre o clima no Sri Lanka. Aproveite e confira as outras dicas para você criar o seu melhor roteiro de viagem pelo Sri Lanka. Como já dizemos, Negombo é a cidade de entrada ou partida para o Sri Lanka. Recomendamos que você fique o máximo 2 dias e aproveite para dar um pulo em Colombo, já que as cidades ficam próximas. Faça uma ponte para conhecer as duas cidades e ganhar energia para as próximas aventuras que vem pela frente! Negombo como pode perceber não tem muitas atrações para conhecer. Vale a pena visitar as festas, os costumes locais e curtir as aventuras pela lagoa. Saboreie as comidas a beira da praia e porque não relaxar em uma das nossas sugestões de albergues e resorts? Fica a nossa dica! E aí meu amigo o que você achou do nosso artigo sobre Negombo, Sri Lanka? Teve algum assunto que não mencionamos? Compartilhe a sua dúvida conosco quem sabe podemos te ajudar a programar melhor a sua viagem em Negombo, Sri Lanka? Estás em viagem pelo Sri Lanka, já passaste por lugares maravilhosos, conheceste culturas milenares e agora paraste em Negombo, Sri Lanka sem saber o que fazer? Vamos adiantar, Negombo é uma cidade que vale a pena visitar pela praia (não vás com muita sede ao pote), alguns locais para visitar e por ser a porta de entrada ou saída. Ou, se estiveres em Colombo, por que não dar um salto a Negombo, já que fica próximo do aeroporto? Bom vamos por parte, primeiro explicaremos o porquê vale a pena reservar alguns dias em Negombo, no Sri Lanka. Por isso se chegaste até aqui vamos explorar as melhores sugestões para conhecer e algumas ideias de como fazer isso e por quais meios. Será que compensa apanhar um tuk-tuk ou dá para fazer o percurso de bicicleta? Por que ficar em Negombo e não em Colombo? Qual a diferença das duas cidades? Como visitar as duas cidades e viver novas experiências? Calma, é normal existirem essas dúvidas contina a leitura que vais ter todas essas respostas. Vem connosco! Porquê visitar Negombo em vez de Colombo? Como te deslocares em Negombo? Como é o clima e qual é a melhor época para visitar para Negombo? A praia de Negombo fica próximo de alguns resorts, hoteis (logo vamos sugerir os melhores), restaurantes e o Dutch Clock Tower. Vale a pena para saborear uma comida ou relaxar. Ela não é das mais limpinhas, certamente existem praias melhores pelo Sri Lanka, mas a praia de Negombo é ideal para caminhar pela orla ou ficar algumas horas a ver os pescadores lançarem as redes. Como fica próxima do Aeroporto, é um bom local para esperar o voo, ou para descansar após a chegada ao Sri Lanka. Visita o Mercado de Peixe, não só para comprar peixe, mas sobretudo para visitar o ambiente e ver o processo de secagem, venda ou transporte dos peixes a outros mercados. Esse método consiste em pegar no peixe fresco e o colocar no sol até que ele fique seco. Surgiu para evitar que os peixes sejam deteriorados no período pós-colheita. Assim o Mercado de Peixes oferece um peixe de qualidade, saboroso a um baixo custo. Em alguns casos, mesmo com essa técnica eles perdem peixes devido às más condições do solo, os ventos ou são contaminados pelos insectos. É interessante ver a variedade de espécies de peixes, alguns pouco comuns por cá, como tubarões, barracudas e outros peixes exóticos. Tem sempre algum guia para te explicar sobre os peixes e os processos de secagem. Eles não cobram, mas é sempre simpático deixar uma gorjeta pela apresentação. O Dutch Fort de Negombo é o antigo forte holandês igual o que tem em Colombo. Lá encontrarás monumentos históricos que servem como bússola para as navegações comerciais que existiam entre o Sri Lanka e outros países. Além disso, servia para proteger a cidade de ataques dos inimigos durante a colonização portuguesa e depois holandesa. O Dutch Fort fica próximo à beira-mar e ainda tem aquele portão colonial do século XVII. Hoje, a atração do forte são os jogos de críquete e os terrenos do local. Vale a pena passar para conhecer a história e tirar algumas fotos. A lagoa de Colombo é um lugar único e até melhor que a praia de Negombo. Tirando as situações sociais dos moradores da região, vale bem a pena parar para conhecer o lugar. Fica próximo da área costeira de Negombo e é uma lagoa excelente para passear de barco, pescar alguns peixes, apreciar a natureza e para fugir da rotina agitada da cidade. Além disso, poderá conhecer uma pesca bem diferente dos moradores da região. O tipo de pesca em Negombo é feita de acordo com as estações do ano, variando o tipo de peixe apanhado. Costumam usar canoas esculpidas de troncos de árvores e pescam com as redes de nylon somente entre setembro a abril. Se estiveres por lá, num dia claro, sem nuvens, ao ires até ao meio da lagoa (é raso) vais avistar a ilha de Jesus e verás que tem um longo pé de coco onde é possível ver os portos dos peixes e os manguezais. A história do Templo Angurukaramulla atrai pela estátua de Buddha, o dragão que fica no interior do templo e os muros de milhares de anos atrás. Além disso vais encontrar as ruínas de uma biblioteca. Para entrar no templo, deves caminhar pela boca do dragão (lá acreditam que irá afastar os maus espíritos) e a estátua tem cerca de seis metros de altura uma verdadeira estrutura. E tem mais no interior, lá encontrarás muita área verde, árvores e no meio uma lagoa com muitas tartarugas. Aproveita para tirar boas fotos. Além disso, existem outras esculturas, pinturas e a história de Buddha no interior do templo. Ao lado do templo tem a stupa com vários leões (estátuas) a guardar o templo. 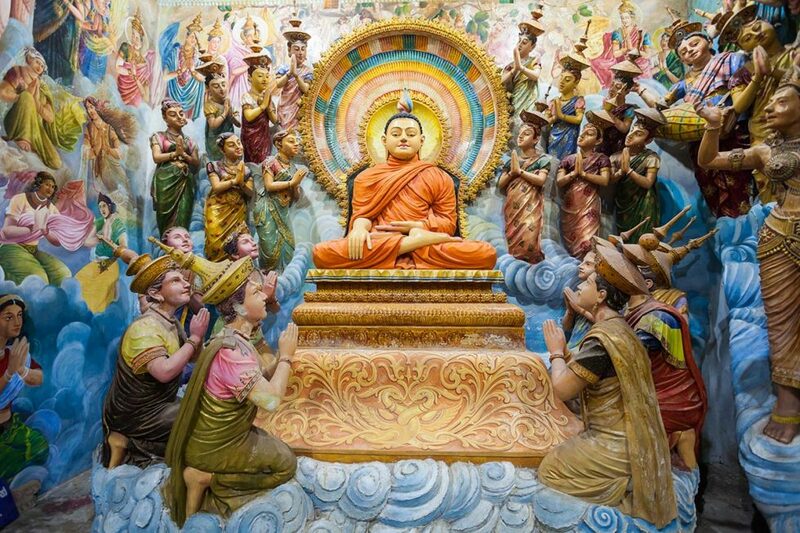 Esse lugar possui outras esculturas e pinturas e pela falta de iluminação, o ideal é ir à tarde para conseguires ver tudo, inclusive a mini stupa no interior da stupa e as obras artísticas. A biblioteca no interior é interessante. Pelas escadarias e pela estrutura dá a impressão que há uns 300 anos atrás, o lugar era bem majestoso. É um lugar que expressa a vida de Cristo. As esculturas e pinturas ainda permanecem vívidas. O destaque do lugar é o altar importado da Europa. Nesse ambiente poderás ver a junção da cultura europeia com a cingalesa: as cores, a exuberância, os detalhes e a arquitetura milenar de um lugar sagrado e encantador. O Canal Holandês é uma reserva de água que corta a cidade e desagua na Lagoa de Negombo. Ele passa por diversas casas, plantações e tem vistas impressionantes. Prepara-te para encontrar um local um pouco poluído com plásticos, mas vale a pena pela experiência de alimentar os macacos e pássaros no decorrer do passeio. Devido a cidade de Negombo ser muito católica, várias aldeias preservam as tradições do cristianismo e realizam apresentações bem trabalhadas, inclusive com actores profissionais. Negombo é uma cidade pequena e as atrações são relativamente próximas. Enquanto que em Colombo a cidade é maior e os destinos ficam dispersos pela cidade, onde precisarás quase sempre de transporte. 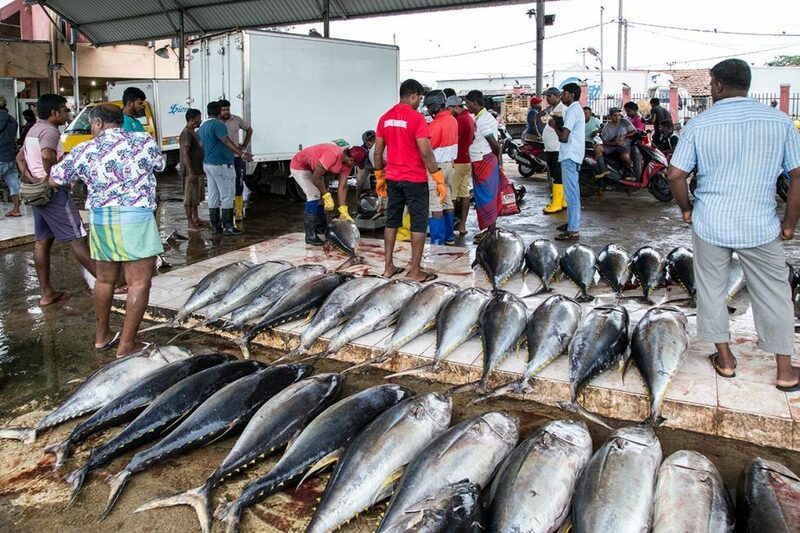 Embora Negombo no Sri Lanka seja mais parada, não faltam opções para conheceres o dia a dia dos cingaleses: visitar o Mercado de Peixes ou até mesmo passear pela lagoa no coração da cidade. Já Colombo, é uma cidade muito rica em atracções, porém é muito barulhenta e será quase impossível relaxar em algum lugar sem movimentações de pessoas. De qualquer modo, vale a pena conhecer as duas cidades. Cada uma revela a sua identidade própria e possuem atracções diferentes e igualmente interessantes. Fica a dica para o seu passeio por Negombo, Sri Lanka. Não compensa andar de tuk-tuk. Além de serem exploradores, as atracções são próximas entre si. Ao descer do aeroporto de Colombo certamente vais querer sair à pressa e entrar no primeiro meio de transporte que surgir à frente. Cuidado, perigo à vista! Calma, que o perigo é com o seu bolso, por enquanto, viajar por essa região é tranquilo para ambos sexos, inclusive para ti que preferes viajar sozinho. Deves-te preocupar é com os charlatões que surgem fazendo-se de bons amigos, mas não passam de exploradores. Falamos dos condutores de rickshaws. Ignore os rickshaws que já ficam à espreita no aeroporto de Colombo à espera para te levar ao teu destino. Do outro lado da rua tem uma estação de autocarro que te podem levar a Negombo sem nenhum problema, apesar de ser um pouco demorado, claro! Outra dica é chamares um Uber pelo aplicativo. A vantagem é que eles são mais rápidos, mas lembra-te que só pagas a ida. Alguns tentam pedir o preço de volta, dizendo que é obrigatório. Ou dizem que não pagaste a corrida (sendo que pagou com o cartão) e pedem dinheiro. Ou pedem para pagar portagens, algo que é custeado pela própria Uber. Para evitar esses conflitos, ao finalizar o pagamento, pede ao motorista para te mostrar a confirmação que a transação foi efetuada com sucesso. Relaxa que temos mais informações e dicas sobre os transportes no Sri Lanka para ficares bem informado e blindado contra esses ataques de enganadores. Caso estejas em Negombo e queiras ir para Colombo, talvez o Uber seja a melhor solução para te transportar de uma cidade para a outra. O autocarro é ainda outra solução, mais barata, mas é um pouco mais demorada. Se não estiveres com pressa, é também uma boa solução. Evita chamar os rickshaws que são mal educados e cobram preços acima do normal. Negombo, Sri Lanka tem restaurantes para todos os gostos: oriental, asiático e até aquelas pizzas tão boas de comer para escapar um pouco da comida asiática. Confere as nossas sugestões! O Mr Burger não tem nada a ver com lanches. Lá servem comidas típicas cingalesas: arroz e curry, paratha, dhal, kuthi. Fica próximo da praia de Negombo, e é um lugar agradável. O dono do restaurante é atencioso e prestativo. Não vás pela aparência do local que não é muito atractiva, mas a experiência gastronómica e para o teu bolso são realmente vantajosas. O restaurante Tusker é um lugar acolhedor onde servem desde comidas cingalesas a comidas diet ou veganas. Ele fica próximo à rua principal, junto a hoteis e a praia de Negombo. Vale pelo custo-benefício, pois não é muito caro. Aproveita para experimentar os camarões, os bolinhos de banana, outro tipo de marisco, o arroz frito, o frango com pimenta e muito mais. O Sea View é um restaurante com esplanada onde servem comidas asiáticas e ocidentais. É considerado um restaurante que possui uns preços e serviços mais diferenciados. Fica próximo a vários hotéis e perto do cemitério público em Negombo, Sri Lanka. Experimenta o camarão grelhado e acompanha com uma cerveja na hora do almoço. Os serviços são muito limpos, podes estar tranquilo! O The Port Beach Restaurant & Pub é um restaurante à beira da praia. O cardápio é preenchido de comida cingalesa com uma pitada da europeia. Fica localizado em frente ao mar próximo da praia de Negombo. Lá servem pratos ocidentais inclusive o típico café da manhã ocidental como as pizzas. Imagina só estar debaixo da sombra, a comer uma bela pizza e tomar um sumo de laranja com coco! O Simplesmente morango é uma doçaria americana que servem gelados, doces, bolos e tortas recheadas. Fica localizado próximo da zona de praia em Negombo. Vale a pena para relaxar e comer guloseimas ocidentais. Quando o sol se põe, Negombo – Sri Lanka ganha vida e energia à beira da praia. Se gostas de beber um copo pela noite, não deixes de visitar os bares da cidade, localizados na rua principal. Não há que enganar. Rodeo Pub: música ao vivo e cockteis exóticos e afrodisíacos. As festas em Negombo – Sri Lanka não são tipo as festas que se vê em locais como o sudeste asiático. Em Negombo tudo deve ser moderado, respeitando sempre os habitantes locais. Não te esqueças de beber com moderação já que a polícia controla isso e se ultrapassares os limites, serás multado. Mesmo andando a pé. Então, controla-te! Confere as nossas sugestões de hoteis ou resorts que preparamos para ficares seguro e confortável durante a tua passagem por Negombo. O Heritance é um resort moderno e agradável. Possui uma excelente localização a cerca de 10 minutos do aeroporto internacional, praias e outros lugares de lazer. Oferece uma comodidade extra para os viajantes que valorizam o conforto ou que pretendem passar mais dias na região de Negombo, Sri Lanka. Este resort é composto por camas de casal ou solteiro, serviços de quarto com comodidades extras como suites, spas e restaurantes. Aproveita para desfrutar da piscina do resort ou receber uma massagem e banhos relaxantes no spa. O Jetwing Sea é um resort clássico que oferece comodidades para um bom dia de descanso. Fica próximo da Torre do relógio holandês a cerca de 6 minutos do aeroporto internacional de Bandaranayake. 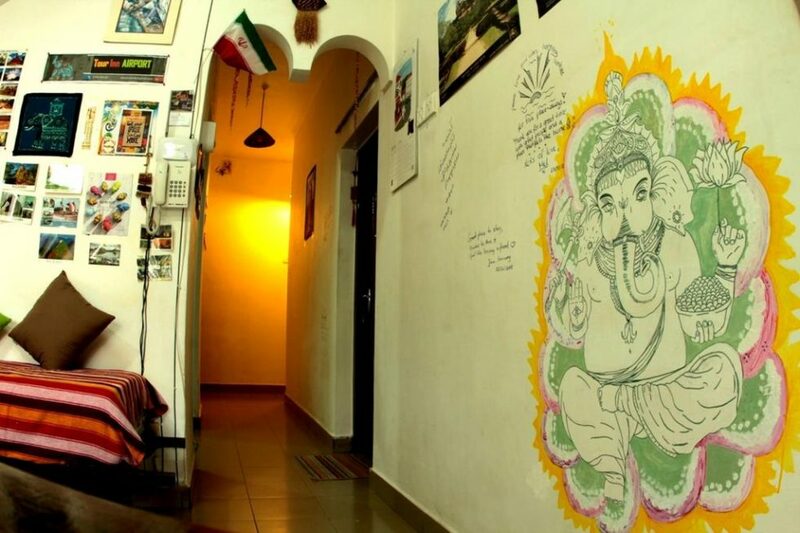 O Tour Inn Hostel é um dos melhores Hostels em Negombo, Sri Lanka. Fica localizado próximo das áreas verdes, da praia e supermercados vários a cerca de 2km. Compensa para uma viagem rápida e confortável, com bom ambiente já que disponibiliza uma sala de estar e cozinha para os hóspedes. O Bluray é um albergue simples, mas também prático já que oferece condições para os viajantes prepararem refeições rápidas. Fica próximo da praia e vale pela economia de pagar por noite e a practicidade de deslocamento. Ao tratar-se de diferenciais pode ser que dependendo do quarto estarás totalmente equipado com frigoríficos e lava-louças. Apesar das temperaturas serem amenas, a humidade do ar é moderada sofrendo leves variações sazonais. Isso porque nas outras épocas há monções que ocorrem na cidade e trazem muito vento e algumas vezes inundações. Temos um artigo com mais informações precisas sobre o clima no Sri Lanka. Aproveita e confera as outras dicas para criares o teu melhor roteiro de viagem pelo Sri Lanka. Recomendamos que fiques o máximo de 2 dias e aproveita para dar um salto a Colombo, já que as cidades ficam próximas. Faz uma ponte para conhecer as duas cidades e ganhar energia para as próximas aventuras que vem pela frente! Negombo como podes perceber não tem muitas atrações para conhecer. Vale a pena visitar as festas, os costumes locais e curtir as aventuras pela lagoa. Saboreia as comidas a beira da praia e porque não relaxar numa das nossas sugestões de hostels e resorts? Fica a nossa dica! E então, o que achaste do nosso artigo sobre Negombo, Sri Lanka? Há algum tema que não mencionamos? Compartilha a tua dúvida connosco, quem sabe, podemos-te ajudar a programar melhor a tua viagem em Negombo, Sri Lanka?